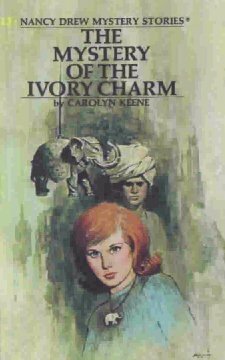 Nancy determines whether an exquisite ivory elephant charm really protects its wearer from harm during her investigation of a circus performer who may be involved in a mysterious illegal scheme. The girl detective’s assignment becomes complicated when the elephant trainer’s young assistant seeks refuge at the Drew home from his cruel foster father. While following clues to help the boy find his real father, Nancy discovers an eerie abandoned house. As she probes, Nancy’s dangerous enemies thwart her efforts to discover a secret surrounding the unusual ivory charm. I was just in the mood for something light and fun, so I picked up this Nancy Drew book. I’ve always loved this series, and it blows my mind that I didn’t read all of them when I was younger. I know that I went to my library and just picked out random ones that sounded interesting to me, so I’ve read quite a few of them, but never in order. This book followed Nancy and her mystery crew to the circus. They went to this circus show and then found this little boy named Rishi who was being abused by his father Rai. They were part of the circus. Rishi followed Nancy home and ended up staying with her to get away from his father. The whole mystery deals with a secret passageway, a crazy house, and an Indian prince. Overall I thought this was a pretty average Nancy Drew mystery. It didn’t really go anywhere, so I found myself to be kind of bored throughout it. I enjoyed Rishi because he’s just cute, but there wasn’t really anything special that happened. I will always love George, Bess, and Ned, so it always makes me happy when they’re part of the stories. I love Ned and Nancy together because they’re just so dang cute. I thought there were a lot of unnecessary characters thrown into this book, though. Too many characters with different and random back stories.